Restlessness, or lying down, getting up, lying down again, etc. 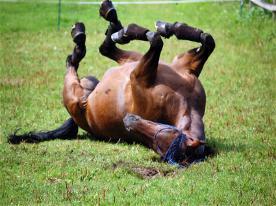 If you horse is already rolling on the ground, thrashing, and sweating, get him up as soon as possible! A horse that is rolling may twist an intestine or complicate an otherwise minor colic. Remember, a colicing horse may be dangerous to be around since it is in pain. Move carefully and be aware when with one. Keep all food and water away from the horse until the vet arrives. Try to keep the horse as calm as possible, and keep it from rolling if possible. You may want to walk the horse for a few minutes, then let the horse stand or lie relaxed. Do not continue to walk the horse for hours.